The affluent neighborhood of South Scottsdale has become the beating heart of shopping, restaurants and entertainment in Scottsdale, a Phoenix suburb known as the West's most Western town. Situated 12 miles northeast of downtown Phoenix, South Scottsdale attracts visitors from all over the metro area with its historic Old Town shopping district and quite the active nightlife scene. Residents enjoy rows of upscale desert homes, expansive parks with recreational lakes and close proximity to the Continental Golf Club. Retirees and families are drawn to the neighborhood's northern developments for their peaceful charm and low crime rate. South Scottsdale's popular downtown area has attracted some of the area's best chefs, resulting in a diverse selection of upscale gastropubs, cheap cafes and Mexican eateries. You find both organic vegetarian dishes and pork shoulder sandwiches along the same stretch of N Scottsdale Road, and the Western and Sonoran desert themes make their way into every establishment's decor and signature plates. Although many residents drive through the neighborhood, bicycles rule the road in South Scottsdale with year-round biking weather and bike lanes along major roads. It's not uncommon to see dozens of bikes parked on the racks outside the shops and restaurants located downtown. Bike-friendly roads provide a safe ride, and areas such as Old Town are especially welcoming to both bike and foot traffic. 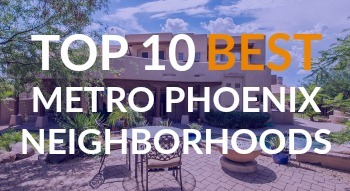 South Scottsdale has also earned a reputation as a shopper's paradise with its trove of high-end boutiques, antique shops, thrift stores, and art galleries that whisper of the neighborhood's Western heritage while catering to the designer-handbag crowd. For window shopping, head to the neighborhood's retail heart in downtown Scottsdale and along Goldwater Boulevard. 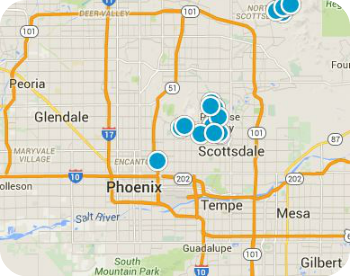 Buying or selling a home in the South Scottsdale neighborhood of Phoenix AZ? We have the complete MLS inventory of South Scottsdale homes for sale. Sign up for new listing alerts and be the first to see the latest South Scottsdale homes as soon as the hit the market.